The July Jelly Roll Party quilt at Ruth's Stitchery will be Hexagon Garden by Pam & Nicky Lintott. 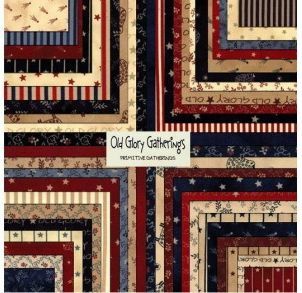 Since it's for July, I used the "Old Glory Gatherings" jelly roll by Primitive Gatherings. Here are some hints for making this quilt. You will need a design wall. If you don't have one, a flannel-backed plastic tablecloth will serve. Pin early and often -- every seam is not too much. Don't try to chain piece the triangles together. It's too easy to lose your place and sew the wrong pieces together (ask me how I know this!). It would be easier to sew the rows together if you could arrange your design wall to be within reach of your sewing machine! Be very careful when pressing, as you'll be working with bias edges. Remember: press, don't iron! I found the directions to be a little vague about how to trim off the edges so they were a straight line before adding the borders. [In fact, the pattern doesn't explain this at all!] I used my 8.5" X 24" Creative Grids ruler and trimmed at just a smidge wider than 1/4" away from the edge of the points on the right-hand side of the quilt. Then reverse and repeat for the opposite side. Even with my greatest care, I found the centers of my hexagons "poofed" a bit. Buts, as my long-armer jokes, "that will quilt out." Well, it did, but washing the quilt and laying it flat on the bed to finish drying is what made it lie nice and flat! The candle is lit for the Sailors on the USS George Washington, who will soon be heading out to sea for their summer cruise. Fair winds and following seas! Addendum: had to add this image from Amy Barickman on Facebook. 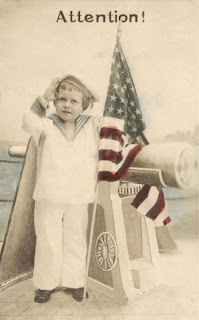 Happy Flag day to all ships at sea! 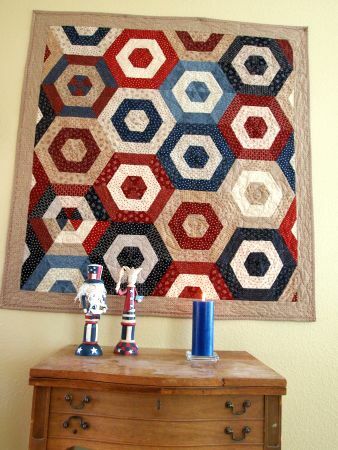 That's a striking looking quilt! Sounds like the pattern left out some important tips but it turned out great, no poofy centres that I can see! What a beauty - it is so striking in those colors! Glad you conquered it. 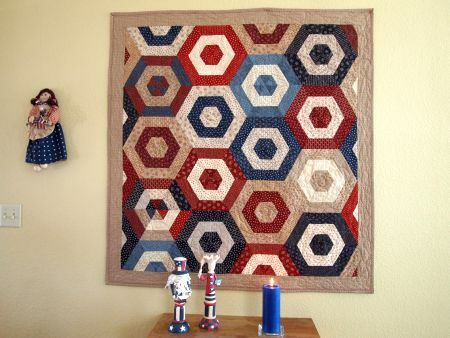 I love that quilt and I think that it will look great in the colors you picked! Its a very effective pattern - but I can see so many places where it could go out of whack...very patriotic quilt for Flag day and thanks for the history lesson.